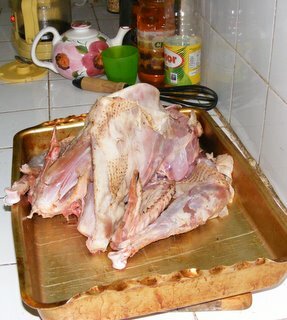 Adventures in West Africa with Rob & Lois » Blog Archive » Christmas Turkey Traumas! After 20 minutes of twisting, dislocating and chopping, Rob managed to make it look like a British supermarket turkey, rather than a meal fit for ‘Santa Claws’. There was actually a reasonable amount of meat on it (though not considering we paid for 2.5kilos of ‘turkey’). 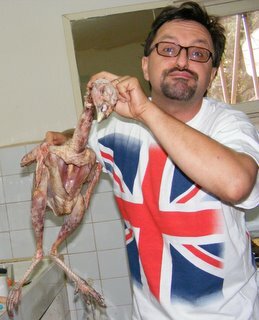 1 Comment posted on "Christmas Turkey Traumas!" Yep, I give our fish heads to the girl who works for us! She thinks I’m funny … but I am just proud of myself that I’ve learnt to cut the head and tail off and clean and gut it myself! !